Venom is in fact an alien symbiote who requires bonding to a host to survive and its most famous host is Eddie Brock. As with all magazine characters there are typically re-imagined and totally different versions to a characters past, we've chosen to follow one plot that unfolded within the comic books. The symbiote in fact, first bonded to Spider-Man and not Eddie Brock after a battle where Spider-Man had damaged his costume. 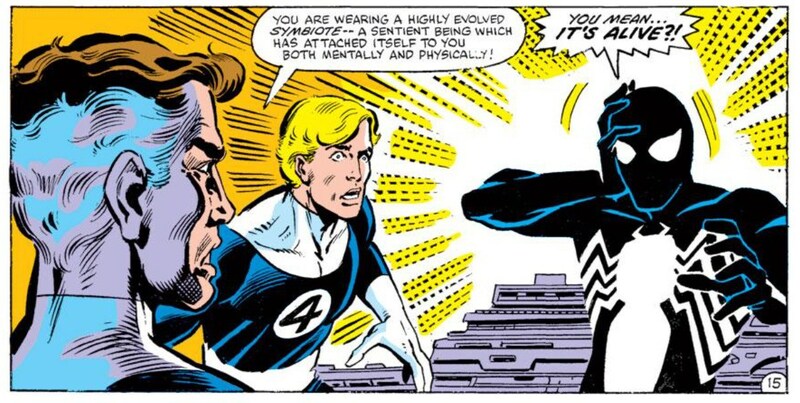 The symbiote bonded to him offering him a new stronger suit, however after Reed Richards of the Fantastic Four encouraged spider-man to research his costume further he learned that the suit was in fact a parasite attempting to bond physically and mentally to him. Spider-Man goes to a clock tower hoping the intense sound of the bells would destroy the symbiote freeing him from the costume however it is Spider-Man who succumbs to the noise first. It is then discovered that in its time bonded to Spider-Man the symbiote had learned human emotions and more importantly how to act on them. The symbiote sacrifices itself in order to save Spider-Man and slithers away weak and dying into the church below where it finds a suicidal man by the name of Eddie Brock to bond with who had his own ties to Spider-Man. Brock had been a respectable journalist living in New York when investigating a story involving the serial killer named Sin-Eater. Brock finds a man confessing to the crimes and after reporting it, it is discovered that Spider-Man had in fact caught the real Sin-Eater and the man Brock had found and accused turned out to be a compulsive confessor. Humiliated and discredited for his mistake Brock's wife leaves him and he is fired from his job. Blaming everything on Spider-Man, Brock began a physical training regimen that put his body in peak form, this also help fuel his violent obsession with Spider-Man. Attracted by his great source of emotion and physical form the symbiote costume gave Brock the same abilities as Spider-Man and in many ways made him more powerful. After the symbiote costume divulges to Brock all the information it discovered about Spider-Man including his secret identity. Brock names himself as Venom claiming he is the poison to Peter Parker and Spider-Man. Paranoid that the costume would abandon him for Spider-Man given the chance, Venom vows to kill Spider-Man and his family. It is also worth mentioning that the Venom symbiote has an offspring Carnage, but we won’t talk about Carnage here as he will need his own post. For a more detailed look check out Origin History of Venom. I am a huge fan of Marvel, Marvel Trading Cards and the Marvel Universes.